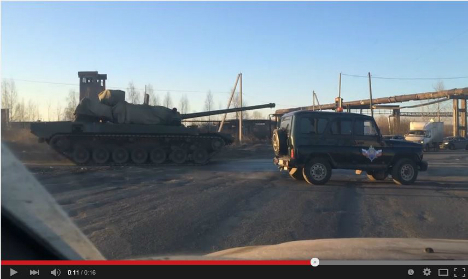 A video of a Russian tank purported to be the new Russian T-14 Armata tank has been posted on the internet. The short video clip, which lasts only 16 seconds, shows a passing tank covered with camouflage, which in its external appearance is different from all current Russian armored combat vehicles. According to Russian media, the Armata may be presented for the first time to the public during the Victory Parade in Moscow on May 9 this year. First of all, the publication writes, it has been confirmed that this tank is equipped with an unmanned turret, and that its crew will be located in the front of the machine in an armored capsule. According to information leaked to the Russian press, the Armata will also have a machine gun with remote-control loading and its own radar station, which can track up to 40 moving and up to 25 aerodynamic targets as well as monitor a territory within a radius of 100 km. According to unconfirmed reports, the Russian Army will receive just over thirty T-14 tanks before the end of 2015.